Listening to the stimulating FluiDensity is akin to eavesdropping on an intelligent, ad-lib conversation between two friends. 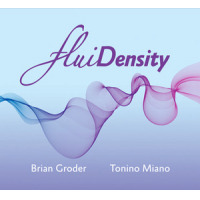 Trumpeter Brian Groder and pianist Tonino Miano, both master improvisers, mine the modernist western musical canon for the majority of their ideas and spice it up with a bit of jazz and various ethnic motifs. The energetic "Optika," with its intricately woven spontaneous dialogue, is perhaps the jazziest track on the record. Blues-tinged lines characterize both Groder's bright undulating horn and Miano's contemplative and resonant keys. Vaguely Asian sensibilities endow the intriguing "Depth of Field." Miano's warm and edgy piano constructs sharp, crystalline rhythmic and harmonic flourishes, over which Groder's clear and open trumpet blows a wistful chant like wind through a Zen garden. The deep camaraderie that the two share makes for a gratifying listening experience, as Groder's hypnotic and lilting horn and Miano's clever, glissando-filled pianism produce imaginative and penetrating poetry on "Opposite Geometry." A consummate musician, Groder is known for his progressive and unorthodox approach to composing. On "Phase Shift," he brings this unique touch to extemporizing as well. His burnished tones engage in a delightfully dissonant duet with Miano's breakneck arpeggios and percussive notes. No stranger to working with unconventional and edgy pianists (Burton Greene) for instance), Groder deftly matches his fast staccato lines to Miano's inventive acrobatics, bringing the tune to an intriguing climax. The Bologna-native/New York-based Miano is conservatory trained and holds dual degrees in musicology and classical piano performance. The influence of groundbreaking 20th century composers is clear in his improvisations. He combines a sophisticated atonality and dark passion in his heady and mordant sound on the cinematic "Wiser Counter Clock," which ends in a thought-provoking sonic explosion, and also features Groder's angst-laden, meandering melody. With this absorbing disc, Groder and Miano have politely but firmly torn down artificial boundaries between musical genres. Although it may be not for purists, this provocative yet accessible album enthralls and fascinates through several spins.